Colin Campbell was born in Glasgow on 20 October 1792. He was the eldest son of John Macliver, a carpenter in Glasgow and Agnes Campbell who belonged to the Campbells of Islay. He was educated at the expense of his uncle Colonel John Campbell, who in 1807 also introduced Campbell to the Duke of York as a candidate for a commission in the army. On 26 May 1808 he was appointed as an ensign in the 9th Regiment, and sailed to Portugal with the 2nd battalion, with Sir Arthur Wellesley's expedition. He fought at the battle of Rolica and was present at Vimeiro; he also served with his regiment in Sir John Moore's advance to Salamanca, and the retreat to Corunna. He was with the first Battalion of the 9th Regiment in the Walcheren expedition, where he caught fever. On 28 January 1809 Campbell became a Lieutenant and in 1810 he joined the 2nd Battalion in Gibraltar. Lieutenant-General Colin Campbell then attached Campbell to the Spanish army where he served with them until December 1811. He then rejoined the 2nd Battalion. In January 1813 he joined the 1st Battalion of the 9th, under the command of Colonel John Cameron. Campbell served at the battle of Vittoria and the siege of San Sebastian. On 17 July 1813 Campbell led the attack on the fortified convent of San Bartholomé; on 25 July he led the unsuccessful attempt to storm the fortress itself. He was wounded twice and subsequently was recommended for promotion. On 9 November 1813 he was given a company in the 60th rifles. He was awarded a pension of £100 a year for his wounds, and ordered to join the 7th battalion of the 60th rifles in Nova Scotia. 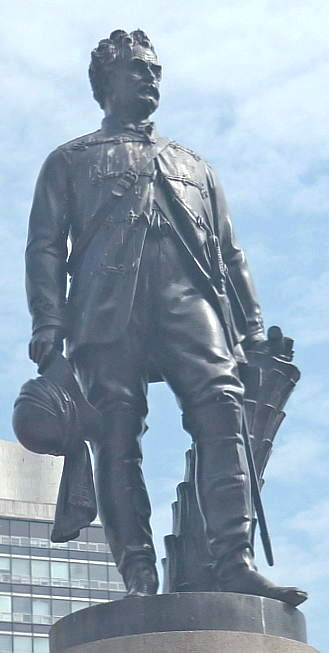 Campbell reached the rank of captain in five years but it took almost another thirty years before he became a Colonel. He joined the 5th battalion of the 60th Rifles at Gibraltar in November 1816 and in 1818 he was transferred to the 21st regiment (the Royal Scots Fusiliers) which he joined in Barbados in April 1819. In 1821 he became both aide-de-camp to the governor of British Guiana and Brigade-Major to the troops at Demerara. In 1825 he purchased his commission as a Major. In 1826 he returned to England where he had powerful friends at headquarters. On 26 October 1832 he paid £1,300 for a lieutenant-colonelcy but continued to seek command of a regiment. In 1835 he was appointed Lieutenant-Colonel of the 9th; he exchanged to the 98th on its return from the Cape in 1837. He commanded that regiment in the north of England where it became so efficient that it was repeatedly praised by Sir Charles Napier, the general commanding the northern district. In 1841 Campbell went to China with the 98th to reinforce the army there under Sir Hugh Gough. They reached Hong Kong on 2 June 1842 and were involved in the Opium Wars in China despite being badly hit by fever. At the peace his regiment was ordered to Hong Kong, where Campbell assumed the command of the troops. He was mentioned in despatches, appointed aide-de-camp to the Queen, promoted to the rank of Colonel and created a C.B. In January 1844 he became a Brigadier-General and took over the command of the brigade in Chusan where he remained until 25 July 1846. He reached Calcutta on 24 October 1846 and in January 1847 he was appointed to the command of the brigade at Lahore. He fought in the Sikh Wars in India; his services were recognised by him being made a K.C.B. in 1849. Campbell wanted to return to England and retire: he said in his diary on 20 October 1849, 'I am growing old and only fit for retirement'. However, on the request of Lord Dalhousie and Sir Charles Napier, he remained and spent a further three years at the frontier post. He resigned his command on 25 July and in March 1853 he reached England after an absence of twelve years. He went on half-pay, and took a year's holiday in visiting his many friends, including Sir Charles Napier. On 11 February 1854 Campbell was offered the command of one of the two brigades which were to be sent to the Crimea. Campbell accepted but by the time he reached Turkey the 'division' was an army, and he was appointed as the commander of the Highland Brigade of the 1st Division under the command of the Duke of Cambridge. The Division consisting of the 42nd, 79th, and 93rd Highlanders. On 20 June 1854, while he was at Varna, he was promoted to the rank of Major-General. He landed in the Crimea and fought at the battle of the Alma. He led his brigade against the redoubt which had been retaken by the enemy and overthrew the last columns of the Russians. The only reward he asked was for permission to wear the highland bonnet instead of the cocked hat of a general officer. Campbell was appointed as commander at Balaclava; his services were recognised by his promotion to the colonelcy of the 67th regiment on 24 October 1854. As commander at Balaclava he was responsible for the repulse of the Russian infantry column by the 93rd Highlanders, but he was not involved in the action at Inkerman. In December 1854 he assumed the command of the First Division, consisting of the Guards and Highland Brigades when the Duke of Cambridge returned to England. Campbell continued to command at Balaclava and to do all he could to improve the comfort of the army during the winter. He received continual thanks for his services from Lord Raglan; he was made a G.C.B. on 5 July 1855. On 16 June 1855 he led the 1st Division up to the front, and commanded the reserve at the storming of the Redan on 8 September. However, Campbell's position was being undermined: Lord Panmure proposed that he should become governor of Malta, and then suggested that he should serve under Codrington, who had never seen a shot fired until the battle of the Alma. In disgust, Campbell left the Crimea on 3 November. He was persuaded to rethink his position and on 4 June 1856 he was promoted to the rank of Lieutenant-General, returning to the Crimea to take command of a corps under Codrington. Campbell only commanded the Highland Division for a month and then returned to England. He was made a grand officer of the Legion of Honour, a Knight Grand Cross of the Order of St. Maurice and St. Lazarus, and a Knight of the First Class of the Order of the Medjidie. He received a sword of honour from Glasgow and was made an honorary D.C.L. by the University of Oxford. In July 1856 Campbell took over the command of the south-eastern district and in September was appointed inspector-general of infantry. In December 1856 he was sent to Berlin to invest the Prince of Prussia with the Grand Cross of the Bath. In March 1857 he was offered the command of the expedition then forming for China, which he refused. On 11 July the news of the Indian Mutiny and the death of General Anson (the commander-in-chief in India) arrived in Britain. Lord Palmerston sent for Campbell and offered him the post of commander-in-chief which Campbell accepted. The following day he left for India, arriving in Calcutta in August. By that time, Major-General Archdale Wilson had recovered Delhi and Havelock had taken Cawnpore and had begun preparations for the relief of Lucknow. The entire campaign lasted over a year, at the end of which India was brought under British control. On 14 May 1858 Campbell was promoted to the rank of General and on 15 January 1858 he was made colonel of the 93rd Highlanders. In June 1861, on the foundation of the Order, he was made a K.S.I. ; and on 3 July 1858 he was elevated to the peerage as Lord Clyde of Clydesdale. By this time his health was failing and on 4 June 1860 - with great regret - he left India. One of the last acts of the East India Company was to vote Campbell a pension of £2,000 a year; in July 1860 he was appointed colonel of the Coldstream Guards; on 9 November 1862 he was made a Field Marshal. In December 1860 he was presented with the freedom of the city of London; in 1861 he represented the Horse Guards at the Prussian manoeuvres; and in April 1862 he commanded at the Easter volunteer review. Campbell died on 14 August 1863 and was buried in Westminster Abbey on 22 August.